C. Zervos, Pablo Picasso: Oeuvres de 1964, vol. 24, Paris, 1971, no. 348 (illustrated p. 136). The Picasso Project, ed., Picasso's Paintings, Watercolors, Drawings, and Sculpture: The Sixties II 1964-1967, San Francisco, 2002, no. 64-347 (illustrated p. 122). The present work belongs to a series of paintings of men's heads, boy's heads and reclining nudes (some with the artist and some without), all executed in December 1964. Although wide ranging in subject matter the series' defining characteristic is a continuation of a compositional device that had occupied the artist throughout November; the simplification of the human form into vibrant slashes of pure colour. Picasso has begun the process with these boldly executed, zig-zagging strokes, a structure which then suggests the motif and thus the arrangement of the human features or, in the case of the nudes, the remainder of the composition. Many of the series in fact share the central blue line of the present composition which splits at the lower edge to suggest the figure's neck and shoulders. 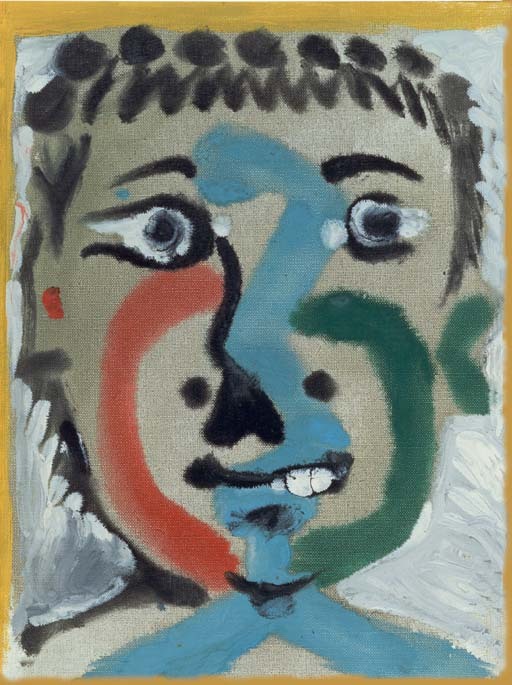 Picasso has then complemented this with two lines of colour on either side, forming the boy's rounded face. The result is a simple but effective framework around which Picasso then builds up the boy's features; his messy hair, large doe eyes and cheeky grin contributing to the image of a fresh faced child. In many of the portraits of men and boys from this time Picasso focusses very tightly on the face, flattening the composition and further emphasizing the central colours. In the present work the artist has even added a fictive frame in yellow, enclosing the boy's head still further. Tête de garçon is the last of three oils Picasso painted on Christmas day 1964 (Z.14.346 & 347).